In a new review paper in Nature this week, Andreae, Jones and Cox expand on the idea that uncertainty in climate sensitivity is directly related to uncertainty in present day aerosol forcing (see also this New Scientist commentary). This was discussed here a couple of months back in the Global Dimming and the climateprediction.net posts, and so it is worth revisiting the question in the light of their analysis. Over the observational period there is a great deal of uncertainty in the climate forcings – mainly (though not exclusively) associated with various aerosol effects. Given this uncertainty, it has therefore been very difficult to calculate climate sensitivity (how much the globe warms as a result of a change in forcings) using the modern changes in global temperature. Such estimates have tended to have very broad error bars. 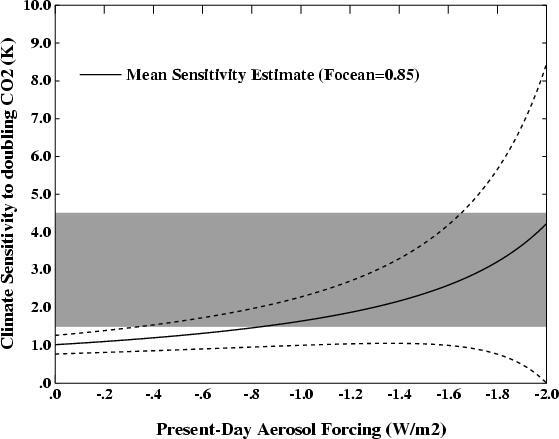 The basic idea of the AJC paper is that any uncertainty in aerosol effects (which is large) translates directly into uncertainty in climate sensitivity. This gives a range of climate sensitivity that is much larger than the IPCC range (1.5 to 4.5 deg C for a doubling of CO2) , and which therefore translates to wider bounds on possible climate projections both at the high end and low end. We contended here before that this is a bit of a leap, since there are other constraints on climate sensitivity (such as the last ice age) and other sources of uncertainty (solar, ozone, land use, etc.). Both of these factors reduce the direct influence that the aerosol forcing alone should have on our ideas of climate sensitivity. This paper is nonetheless interesting for the link that they make to the carbon cycle and the potential for feedbacks that may amplify the CO2 concentration in the future that will depend on the warming, and hence on climate sensitivity. However, the fundamental point which underlies all their calculations is the link between aerosol forcing and sensitivity, which I would argue is not as strong as they have posited. (James Annan has also made a similar point). To demonstrate why this is may be an overstatement, one can look at the results from the GISS ModelE simulations for the 20th Century (illustrated here). In these experiments the climate sensitivity was 2.7 deg C for a doubling of CO2, the net aerosol forcing from 1940 to 2000 was around -0.7 W/m2 (55% of the total forcing, -1.27, from 1850 to 2000), and the ocean uptake of heat was well-matched to recent observations. 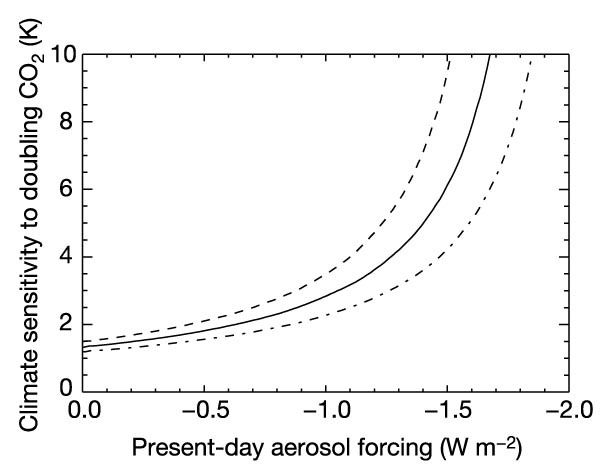 However, this amount of present day aerosol forcing would imply a sensitivity of about 4 deg C according to figure 1 in AJC (right), with 2.7 outside their error bar. What is therefore missing from their calculation? Firstly, there is approximately 0.35 in other forcings over this period (from solar, tropospheric ozone, land use and volcanoes), which if taken into account moves the curve down and to the right. Secondly, there is more uncertainty in the GHG and other forcing terms than they allow for. This actually widens the error bars so much that for large aerosol forcings, you cannot rule out even zero climate sensitivity. These details are not inconsequential because most of the conclusions in their paper stem from the rapid increase in climate sensitivity between 1.0 and 2.0 W/m2 aerosol forcing. I have therefore re-calculated their Figure 1, including the terms for the other forcings and their uncertainties along with the aerosol forcing estimates, and using the ocean heat content changes from Hansen et al (2005) (around 0.85 W/m2 – a smaller value for the ocean heat imbalance moves the curve even further to the right). The IPCC range is shaded. (Note that this calculation doesn’t exactly match the GCM result since I haven’t exactly calibrated the ocean heat content or temperature change from 1940 to 2000 – it’s a good enough guess for this purpose though). What is clear is that although the net aerosol forcing is indeed an important determinant of the uncertainty, it is not overwhelming. Indeed, a broad range of net present-day aerosol forcings of (-0.5 to over -2.0) could still compatible with the IPCC estimates for climate sensitivity (within one sigma of the total forcing error). This is a quite different conclusion to that drawn by AJC. Climate sensitivity is indeed uncertain, but the classic IPCC range (in my opinion) is still a good ‘likely’ estimate. Any suggestion that climate sensitivities are significantly larger (or much smaller) need to be accompanied by an explanation of how forcings and temperature response at the peak of the last ice age (for instance) can be dealt with or explained away. There are a number of papers in the pipeline that tackle this question from a number of different angles (using multiple ensembles for the last ice age, better observational constraints on the climateprediction.net ensembles etc.). I will venture a guess that most of these approaches will actually reduce the error bars on the sensitivity – not increase them. To start this off, many of us can not see the AJC paper in Nature. But I did read the James Annan post and the New Scientist article Annan cites. Accepting what Gavin and Annan say about this result and acknowledging uncertainty in the aerosol negative forcing, I’d like to ask why it is that most projections of sulfate aerosol forcing assume that this kind of pollution is going to diminish in the future. What I see is more and more coal-fired power plants coming online in the US, China, India and elsewhere. Most if not all of these plants will not take advantage of newly developed but expensive clean coal technology to reduce sulfate emissions.Currently, the Clean Air Act here in the US has been revised and is weaker, not stronger, with respect to upgrading power plants to install pollution control equipment. There won’t be fewer people on the planet with smaller energy demands any time soon. SO2 dissolves in water vapor to form H2SO3, sulfurous acid. Some of the sulfurous acid is subsequently oxidized to H2SO4, sulfuric acid. The sulfurous/sulfuric acid portion of the particles which we see as white haze is actually composed of tiny transparent spherical liquid droplets in the 0.01 to 10 micron diameter range. Transparent spherical bodies are retroreflective i.e. they reflect light directly back to the source of illumination. A common example is the glass beads used in highway signage and road stripes to send light back toward the headlights of approaching vehicles. I’m sure this effect diminishes or disappears at some low diameter around the wavelength of light or about 0.7 microns for visible light. My question is: does the retroreflectivity of the larger droplets, i.e. back towards the light source, play into the sulfur aerosol issue or is it simply averaged out by the bulk effect of all the aerosol particles present in the apparently white haze? Can you educate us what the developments are since 2001? And, new power plants with the various anti-pollution technologies (and/or, in many cases using natural gas instead of coal) are much cleaner than the older plants. In fact, the biggest thing that Bush has succeeded in doing in his attack on the Clean Air Act is to allow the older dirty plants to continue operating while remaining “grandfathered” so that they do not need to install the anti-pollution equipment that newer plants have. (Basically, he gutted the New Source Review laws whereby such plants had to install the new anti-pollution technologies if/when they made a large enough upgrade to the plant.) I believe it is these older plants that are responsible for a disproportionate share of the SO2 and other pollutant emissions. Thanks, Joel. Try this one: What will be the net sulfate aerosols pollution, given the additional coal-fired and gas-fired plants to meet increased energy demand as opposed to where we are now (baseline)? I don’t know the answer, I just thought I would ask the question. Not to mention China, Brazil, India and the rest of the world. Convince me that this kind of pollution will diminish in the future. Also, what of the positive feedback from soot and NO2 emissions from energy plants. Where does that fit in? It seems now that, to quantify the doubling CO2 sensitivity, we must know the actual negative forcing of the aerosols. From post to post you say, Gavin, that the greenhouse effect is driven by physical absorption laws. Ok but when someone asks you about far-IR saturation in the absorption bandths of CO2, your answers (Realclimate) are not very convincing. This is a fundamental problem and it should be very interesting to get, from a physicist, a good explanation of this phenomenon of saturation and how,nevertheless,the GH effect is increasing with increasing of CO2 concentration. Many notes in this site concern the surrounding of GH effect, never the fundamentals of this effect, particularly this problem (or no?) of saturation. I hope that you should answer me, for once. Maybe you would find our recent manuscript interesting, in which we use an efficiently-generated ensemble of a state-of-the-art GCM, tuned to present-day climate and validated (tested against out-of-sample data) with simulations of the Last Glacial Maximum. James, will you instead try to submit a comment on the AJC paper? Thanks John for this link but it isn’t the output of an unknown numerical model which can be very convincing. In fact I want to know how to answer to the sceptics arguments concerning the saturation of IR absorption in CO2 bandths. I think it’s possible to answer in simple terms, with some calculations and approximations. For example the knowledge of CO2 absorption coefficients at different frequencies can be useful. Maybe Realclimate reads this post and can answer to this fundamental question ? I think the major worry about global warming is a shifting of ocean currents that could have disastrous consequences on our climate. The movie “The Day After Tomorrow” is a bit of a stretch but we could see the world plunge into an ice age. Given the very grave potential consequences for the Earth’s environment and human society, the only prudent course of action would be to immediately reduce the emissions of climate-warming substances, with reduction targets well below those of the Kyoto protocol. Hi again, don’t know if this is the right forum for this but… Is it clear where the US academy of science and Bruce Albert stands in the GW? And where does Russia stand now and how big impact does Yury Izrael have on the Russian standpoint and what did they mean with “a missunderstanding”? And most important of all, how much of their staitments are based on facts and research? There are several indications that the cooling influence of aerosols is overestimated. To see what the real influence is of aerosols, one need to look at their influence on regional temperatures where there is a large decrease or increase of SO2 (and other aerosol) emissions. There are two such regions: Europe (a 60 % decline in the period 1980-1998) and SE Asia, where there is a strong increase in the last decades. Aerosols in the troposphere have a short life time, thus the influence must be seen in the region within the main wind direction. And the total area where aerosols have their largest influence is relative small (globally around 10%). In contrast, greenhouse gases like CO2 and methane have a global influence, which is less regionally different. Further, the influence is highest in the Northern Hemisphere (NH), where near 90% of SO2 and other aerosols are emitted, with virtually no exchange with the SH. Thus the influence of aerosols must be visible mainly in the NH and specifically in regions downwind the sources where the largest change in emissions has happened. To begin with, there is one natural experiment that did give us some clues: the Pinatubo eruption injected some 20 million tonnes of SO2 directly into the stratosphere, where it stayed for 2-3 years (to make it convenient, let’s say 800 days). The total effect (including water vapour feedback) was a cooling of maximum 0.6 ºC. Humans emit around 80 million tonnes per year, mainly in the troposphere where it lasts for average 4 days. The direct effect of both (scattering on wetted sulphate particles) is virtually the same, which means that the direct effect of human made aerosols is around 0.025 ºC (including a 4-day accumulation). Tropospheric aerosols also have an indirect effect on clouds (more reflective, longer lasting). The IPCC gives a fourfold range increase for this forcing, compared to the direct effect. If we assume this is right, then the net effect of human made SO2 emissions would be 0.1 ºC. But the cooling effect of aerosols incorporated in current models is much larger. The Hadcm3 model has made a retrofit of the influence of aerosol changes in the period 1990-1999 (thanks, William), where there should be an increase of 6 ºC at the place of largest aerosol influence in Europe. That is not visible at all in the surface station data. The Indoex experiment in the Indian Ocean showed a large difference in radiation balance between the NH and the SH near the equator. The NH with a large load of aerosols has a top-of-atmosphere loss of 5 W/m2, and the surface has app. 20 W/m2 less insolation. Despite that, the temperature trends on the South tip of India are more positive than for the only SH climate station (Diego Garcia) in the neighbourhood. Not only land is warming faster in that region, the heat content if the NH Indian Ocean increased slightly more than the SH, if corrected for area (as surrogate for volume). The overall temperature trend for land increased more for the NH than for the SH. Moreover, the heat content of the oceans increased more in the NH than in the SH (again, if corrected for area), while 90% of the aerosols are emitted and have their effect in the NH. Thus it seems to me that either the influence of sulphate aerosols is overestimated, or the influence of soot aerosols underestimated (or both) in current models. Either way, that means that the influence of a CO2 doubling will be on the low side of the IPCC estimates or even below. Of course this is not an exact calculation and it doesn’t include a lot of other items which influence temperature trends. But it would be interesting to compare the modelled regional influence of large changes in aerosols with regional temperature trends and to compare the hemispheric differences in ocean heat content increase with hemispheric aerosol influences on energy balances. If aerosols and GHGs have a lower forcing, that must be compensated by a larger forcing for something else, to fit past temperature trends (especially the 1945-1975 period and other – little – ice ages). This can be done by enhancing solar insolation variability (a factor 3-5 will do the job). Having now read the paper itself and the accompanying article (by Quirin Schiermeier) as well as the press release, I agree with you that the paper itself takes a fairly conservative approach (in the sense of being clear that the risk of aerosol reductions resulting in temperatures much in excess of the IPCC high-end is pretty speculative), but then the article (which I would assume to be more firmly within the control of the Nature editors) is rather stronger and the NERC press release (written by ?) is stronger yet (arguably to the point of alarmism). Maybe you know something I don’t about the provenance of the press release, but it’s not clear to me that it’s fair to stick the authors with reponsibility for it, especially given the moderate tone of Andreae’s quote. Reading the release very closely, it appears to me that the part of the press release you object to is pretty much just in the first two sentences of the paragraph containing the quote. The quote doesn’t actually support the content of those sentences, although the juxtaposition of the two makes it appear so. Time to shoot the messengers? If, as you noted in a comment on your site, the outcome of this new paper and other recent work on aerosols will be just to shift the forthcoming IPCC range of scenarios a little higher, that in and of itself ought to be a huge headline-grabbing deal. Unfortunately it isn’t, which brings us back to the frustrating activity of trying to figure out why there has been such a minimal policy response to the IPCC projections (as most recently exemplified by the G8’s fuzzy statement). I am encouraged to see that a new satellite to detect aerosols will be going up next month, although I was a little taken aback by the comment (in the Nature article) that it may be 20 years before a “clear picture” becomes available. OK, AJC and others (climateprediction.net) are claiming there is some possibility of a large climate sensitivity above what is generally accepted by the climate modelling community, 6 degrees C perhaps as opposed to a more standard range of 2.5C to 4C. Maybe Andreae’s results don’t justify the big call to action — large emissions reductions — but surely you support that anyway based on a large suite of independently arrived at climate science results, right? Of course you do. My point is that some recent reports (e.g. the Ocean Acidification post based on the Royal Society Report here at RC) call for drastic emissions cuts but don’t seem to back that up in their conclusions. What worries me is that as policy-makers refuse to engage climate warming and the science, scientists will come out with increasingly more desperate reports, preliminary studies, etc. that exaggerate the danger and end up shooting themselves in the foot. This would be ironic and tragic since the climate science results (both empirically and hypothetically in models) could hardly be more compelling. It is almost impossible to imagine what change in our fundamental knowledge would overturn the current climate science consensus as last expressed in the IPCC TAR. A climate sensitivity of 3C with a CO2 doubling is certainly scary enough for me. #15 Steve, I don’t really want to flog this to death, but Prof Andreae’s comment seems directly tied to their “central estimate” of 6C warming by 2100 (NewScientist makes that link). The scientists cannot control every word that the press write but they can certainly make sure their press releases are less obviously misleading. FWIW, Chris Jones explicitly disowned the “best estimate we have so far” comment in the Nature News article but Prof Andreae did not reply to my email. Make of that what you will. Note that most of their scary graphs are based on the A2 scenario – the most pessimistic of the 4 main SRES scenarios – and all of the scenarios themselves are predicated on absolutely no action to curb GHG emissions. We are already taking action! Maybe not enough (to some, nothing realistic will never be enough) but next time you see a scary set of extreme predictions remember that the worst ones are predicated on a future that we have already steered away from (and which were hardly likely in the first place). Bush may seem intransigent but remember that although a week is a long time in politics, even a decade is a fairly short time in climatological terms. That’s not a call for inaction, just a bit of perspective. It’s not fair of me to just pick on this AJC paper – so for another example, Tim Palmer quite clearly misrepresented the Stainforth et al CPDN paper in a public presentation at the Royal Society earlier this year. Again, the paper had the appropriate disclaimers, but it looks like Tim Palmer decided to “simplify” things for the “benefit” of the audience, so how are journalists and the public (who don’t even get to read the paper) supposed to work out what it really means? #16 Yes Dave, that is exactly what worries me too – increasingly shrill and exaggerated scaremongering from scientists who want stronger action. They should be able to argue it on the case of 1.5-3C warming by 2100 (which IMO seems to be our current course) if they think that is serious enough. Which it probably is, but I’m not really up on the impacts stuff. FFS I’m sounding like a sceptic here. I’m anything but! I do not understand the GISS Model/IPCC implementation of the Enhanced Greenhouse effect. I do understand that the solar energy-in dictates the earthly energy-out at equilibrium at the balance point at the Top Of Atmosphere (~10,000m) and that unless the solar-in changes then the law of conservation of energy requires that the Stefan-Boltzman derived 255 K temperature at equilibrium at this balance point can not change. Also that the ~ 4W/m2 change to 1364W/m2 (or 0.29%) in Solar energy-in from 1700 to ~2000( http://www.grida.no/climate/ipcc_tar/wg1/245.htm) would account for about 0.0029 x 255 K = ~ 0.75 degree absolute rise in temperature. Also the IPCC says there is an uncertainty of ~2, so this could easily account for ALL of the observed and real hockey stick rise in global temperature. I think I understand why in theory changing the constituents in the atmosphere (ie adding anthropogenic CO2 or the Enhanced GH effect) could change the ability of the atmosphere to absorb outgoing energy (see the Y. Kushnir GISS/IDEO/Columbia U. summer 05 lecture notes and slides http://www.ldeo.columbia.edu/~kushnir/MPA-ENVP/Climate/, especially for absorbtion spectra), and result in a change in the slope of the temperature gradient from the TOA to ground level, and result in an increase in ground level temperatures. (ie GHG induced global warming.) It also seems that even though the selective absorption of specific energy bands by different molecules IS the mechanism to add energy to the air, the energy absorbed by CO2 & especially Water Vapor is extremely rapidly dispersed by molecular collisions to ALL the components of the atmosphere, so that the N2 and O2 also heatup, and all the atmospheric components assume a uniform temperature (ie global warming). I assume that the ultimate atmospheric temperature is then dictated (approximately) by the ideal gas law, PV=nRT at the different elevations, and pegged to ~255 K at the ~10,000m TOA energy balance point. What I do not understand is how the gas law limitations are imposed on the CO2 spectrally absorbed energy and how this is implemented in the computer models. Question 1:- IPCC Box 1, http://www.grida.no/climate/ipcc_tar/wg1/011.htm , says that adding CO2 results in the new CO2 absorbing more energy (to create the anthropogenic GHG forcing), heating up by taking some of the earth’s energy-out flux, and then warming the atmosphere. WHY does only the new CO2 heatup? & why not the old natural CO2? How can one specific segment of the atmosphere heatup more than another identical segment? Since anthropogenic emitted CO2 comes out of a power plant stacks/vehicle exhausts at an elevated temperature (due to the trivial manmade waste heat energy), and then cools down to near equilibrium with the rest of the atmosphere, why would this new CO2 then absorb more energy and heatup again? Wouldn’t a CO2 molecule that absorbs an extra photon just reemit it to stay at the equilibrium temperature? This simple IPCC description of the enhanced greenhouse effect just does not make sense. Alternatively, if the CO2 does absorb the extra energy up to its saturation limit & then transmits it to the air by molecular collisions to achieve global warming, then there is no limitation on the CO2 absorbing another photon, ad infinitum- which is obviously absurd. The ideal gas law must impose the limitation on CO2 warming. Question 3: If the change in PV=nRT due to the change in CO2/O2 concentration IS small, negative or negligible , then wouldn’t you expect the change in temperature to also be small or negligible? ie does a slightly lower density of air mean a slightly lower ground level temperature (temperature normally decreases with height at the lower air density), so that in reality adding CO2 and subtracting more O2 actually causes miniscule or trivial global COOLING, and the (unused) ability of the changed atmosphere to absorb radiation energy and transmit it to the rest of the air is overruled or limited by the ideal gas law? If this is valid wouldn’t it mean that adding CO2 does NOT cause global warming? That the sun is directly responsible for the observed global warming? It also resolves my problem with a solar forcing that can account for all the warming (see above), but also a GHG Forcing that is 10 times as large as the solar forcing, and no warming left to be accounted for. Something is fishy somewhere. Common sense says that the sun causes daily/yearly temperature fluctuations, and changes in the sun and Milankovitch factors supposedly cause millennial ice-age fluctuations. It just seems strange that a few molecules of CO2 cause the 30 to 300 year changes. Sorry Gavin, but I am a skeptic, looking for an explanation. Thanks for the info & response in #19. I DO appreciate your efforts. I also apologize for not making my point clear, so I am going to try again. It may get repetitive since I will try to say the same thing several times from different perspectives. What I believe will happen is that the new GHGs will be released from power plant stacks/vehicle exhausts at elevated temperatures due to trivial waste heat. Because the new GHGs are at an elevated temperature, they will NOT absorb heat energy from the air. Energy will NOT flow uphill, only from hot to colder objects. In fact the GHGs will actually cool down by slightly heating the air by molecular collisions, and result in the energy-out flux slightly increasing by a trivial amount to exhaust this waste heat to space. The new gases are assumed to cool to ambient equilibrium and the energy-out flux is assumed to remain constant due to the trivial waste heat effects. At this point we have the question of the ENHANCED GREENHOUSE EFFECT to consider. Per the IPCC Report Box #1, http://www.grida.no/climate/ipcc_tar/wg1/011.htm, the EGH Effect consists of the absorption of energy-out flux by the newly emitted GHGs which then very quickly transfer the absorbed energy by molecular collisions to the rest of the air including the old GHGs. The absorption of energy results in the GHG Forcing. It is assigned only to the new GHGs, because it is assumed that the old GHGs had already come to equilibrium with the air and the pre-existing energy-out flux prior to the emission of the new GHGs. This is the basic cornerstone assumption for GHG induced global warming. or stated another way: The IPCC and GISS model assert that ” As extra CO2 is added, more absorption occurs and more LW is radiated up and down. This makes it more difficult for the surface to radiate to space, and so the surface warms up to increase the flux of LW.” (quote Gavin from response to #19- he writes better than I do!). If the new GHG temperature is the same or higher than the air temp , then there will be NO energy absorption by radiation by the new GHGs or any other air or GHG molecules. Any absorption by radiation would result in the gases getting warmer than their equilibrium temperature. They would immediately reradiate the energy to return to equilibrium conditions. If the energy from the energy-out flux is used to heatup the new GHGs, in order to heatup the rest of the air, then the reduction of the flux dictates, by Stefan-Boltzman, that the air temp must be reduced. However, we have not reduced the air temp, we have added absorbed energy to the GHGs thus increasing the air temp. Thus taking flux energy to heat the GHGs/air that dictates the flux energy is impossible, and self contradictory. The only way flux energy can heatup the air is if the (solar) energy-in flux is increased to set a new equilibrium. From a flux perspective, If a photon of energy from the energy-out flux does impact a new GHG molecule, it will bounce off, or be absorbed and immediately reemitted, because the GHG molecule is already at the same equilibrium temperature, or warmer from waste heat, than the rest of the air. There would be no increase in LW flux, either up or down. Absorbing a flux photon would raise the new GHG molecule temperature, and the GHG molecule would immediately reject the photon to return to the equilibrium temperature. Similarly if the photon hits an old GHG molecule which is at equilibrium, it too would bounce off and not be absorbed, because this is exactly what was happening to the air and old GHGs before the addition of the new GHGs. Also note that if the GHG molecule did have the ability to absorb flux-out energy and heatup the air, it would be a perpetual motion machine, because as soon as it absorbed radiated energy it would transmit it to the air by molecular collisions, and then be able to absorb another radiated flux photon ad infinitum. This is not possible. Since all the gases are already at equilibrium, any LW flux photon that is directed down will just bounce off until it bounces out to space. There is no increase of LW flux, or increase in ground/air temperature. The Enhanced GH Effects model for adding GHGs FAILS to account for the gases reaching equilibrium temperature per the gas law, and then refusing to accept more energy absorption. The ability of the GHGs to absorb more energy and vibrate more than O2 for example, is NOT used. If there is no new energy absorption by the new GHGs, then the GHG Forcing is ZERO or negligible. The addition of the new GHGs has a negligible effect on the air temperature, per the gas law. CO2 does NOT cause global warming. Now consider SOLAR insolation energy. In #19 it was claimed that the ~ 4W/m2 change to 1364W/m2 (or 0.29%) in Solar energy-in from 1700 to ~2000( http://www.grida.no/climate/ipcc_tar/wg1/245.htm) would account for about 0.0029 x 255 K = ~ 0.75 degree absolute rise in temperature. Also the IPCC says there is an uncertainty of ~2, so this could easily account for ALL of the observed and real hockey stick rise in global temperature. Gavin objected to the choice of ~4W/m2 increase as being on the high end (which it is). So I will modify it. Assume only 3 W/m2, so 3/1364 = .0022, or 0.22%. But it is at ground level so this is multiplied by the 288 K ground temperature to get a 0.63 degree Absolute rise in temperature due to increases in solar insolation from 1700 to 2000. Same conclusion, the solar insolation is within the range of being able to account for ALL the observed global warming. I thought that we had already disposed of the fact that more recent temp data is rising faster than the solar forcing. If you go back to the 1700-1750 time frame it was the reverse. More solar forcing, less temp increase. This is exactly what happens on any, no EVERY, typical day (see the online daily data from Luxembourg @ http://meteo.lcd.lu/today_01.html. ) The earthly systemic lags make the temp lag behind the solar forcing. In the 1700-1750 time I would attribute it to most of the heat going into the latent heat of warming the ice, not the air temp. In the later phases 1950-2000, I would say that the solar forcing is peaking, & the temp data is still rising, and perhaps there is a heat reservoir in the ocean’s 0.85 degree rise (???) that is now forcing the air temps to lag behind and stay high. In exactly the same way as on a daily basis the peak temp is in mid afternoon, & the peak solar forcing is at noon. This time lag phenomenon is also evident in the ice age charts , and according to this website is about 800 years. This argument of inconsistent timing is not conclusive – one way or the other, just a complicating factor. Sorry Gavin, my skepticism level is getting higher. Your responses have just reinforced my skepticism. I just do not believe or understand that one basic assumption (IPCC Box number ONE) that the enhanced greenhouse effect causes a significant increase in temperature. If it is wrong, then the whole “GHG/CO2 causes global warming” issue has just been turned upside down. CO2 will not cause warming. Global warming will still exist, it will just be caused by the sun. So this is serious. Please give this some serious thought. My thought is that “…trace constituents change…” sounds suspiciously like a butterfly flapping its wings in the Amazon, “causing” a hurricane in the Texas Gulf. While its true that a butterfly can move a few cc’s of air, it cannot manufacture energy out of nothing. It was the sun that caused all the heat energy that caused the hurricane in the Texas Gulf. The butterfly just happened to flap at the same time. I think the enhanced greenhouse effect is as mythical as the butterfly effect. Thanks for your time & responses. I appreciate all your efforts both in this website and in the extremely complex GISS model, even if I think it has a flaw or two. Re #20: Just on a very high level, when one is coming into a new field and is discovering things that one doesn’t understand, it is best to assume, at least tentatively, that this is due to one’s own ignorance on the subject and not due to the fact that the people who have spent their careers studying it are all wrong. On a grittier level, you are confusing yourself with totally irrelevant things. The temperature of the released CO2 molecules is a negligible effect. As an analogy, if I told you that I was going to paint my white car black and that I expected it would get hotter on sunny days as a result, you would probably start asking questions about what the temperature of the paint was when I applied it and how those molecules heated up or cooled down, ignoring the relevant factor which is this: By painting the car black, I am changing the car’s albedo and thus changing the radiative balance between the car and the sun on sunny days. Note that in some sense you are right that it is the sun that matters…Without the sun, the addition of a little bit of heat and molecules to the atmosphere would have a negligible effect. However, the sun provides an abundant source of energy and by changing the earth’s radiative balance so that we absorb a little more of that energy, we are having an important effect on the earth’s climate. All your talk about ideal gas laws and what temperature the CO2 is emitted at are just irrelevant factors that are obscuring this fundamental fact. Joel, thanks for the advice. I have been studying this for several years now. Most of it is basic high school physics, (I have a masters in Nuclear Engineering) so it is not difficult, just very obscure and complex. The real research, what Gavin does, includes alot of dreary drudge work, the classic 1% inspiration, 99% perspiration. I have the greatest respect for what Gavin et al have done. Hey, they said we were in global warming, when everyone else said you’re crazy. They were right. That doesn’t mean that they got it ALL right. In most of my posts you will notice that they are in the form of questions (eg see #19 above. which Gavin very obligingly answers – as long as I don’t tell him he is wrong) If you note his answer to my question 3 in #19, you see that he says I’m wrong but doesn’t say why. I still don’t understand why, but I sure will NOT just take his word for it. The physics has to make sense. HOWEVER, there are also hints, eg the fact that there IS a major controversy over whether theIPCC/computer model theory is completely valid or not, the fact that there are a whole lot of people known as skeptics, that says that “something” is just not quite right. I’m trying to find out what is not right. At the moment, my understanding of one little part of the physics (probably a fraction of a tenth of a percent of the model) conflicts with Gavin’s & IPCC. That doesn’t necessarily make Gavin & IPCC right, however the chances are pretty good that he is. I’ve also got the entire California legislature that legislated that water vapor is NOT a greenhouse gas, even tho Gavin & I and most of the scientific community say it is. For your technical comment, yes the temp and energy of the released CO2 IS a very trivial item, the value is insignificant, I think it raises the actual air temp by about a millionth of a degree or so. The fact that it makes the emitted CO2 HOTTER than its surroundings & hence not likely to absorb energy from the cooler air is what is significant. The hotter CO2 will cool down (watch the gas plume cool from a power plant stack or a car exhuast! ), not heatup, so where I have a problem is with the IPCC enhanced greenhouse effect assumption that the released CO2 WILL absorb energy and heatup. Why would just this newly released CO2 (the source of the GHG forcing) heatup and NOT the old preexisting CO2 that has been sitting around for years? It just is a little bit fishy. I want someone to explain it since I can’t at the moment. As for the ideal gas law being irrelevant, it is the ideal gas law that dictates what the temperature of the air is. ie the 288 K number, which is also the temperature of the natural CO2 in the air. What I do not understand is how this natural law can be ignored by heating up the CO2 to a higher level and violating (I think) this law. Thanks for the interest- at least someone is reading this. I don’t know about Nature and real climatologists, but I was interested in Efficiently constraining climate sensitivity with paleoclimate simulations. I only have a vague idea what an ensemble Kalman filter is and certainly don’t fully understand it. Nevertheless, it occurred to me that the distribution of an ensemble found using an ensemble Kalman filter may become more circular than it ought to be. When you plot ocean heat uptake against climate sensitivity, I get the impression that the distribution of good models will be a large clump around a climate sensitivity of 3 but then there is a long tail out towards higher sensitivities. Does an ensemble Kalman filtered ensemble become more circular than it should be or otherwise include far too low a proportion of models in that tail? 0. CO2 levels are increasing [and also other GHG]. 1. If there is more CO2 in the atmosphere then more of the outgoing LW radiation will be absorbed by the CO2. 2. Since less energy is being allowed out of the Earth system, the Earth system will warm up. 3. As the Earth warms up it emits more LW radiation and will eventually reach a new equilibrium. Now, the uncertainty in making climate change predictions lies in two areas. Firstly, feedbacks [ie step 3]. What other things in the Earth system will change when it warms up that will affect how much SW radiation is reflected back into space [eg ice-albedo feedback, cloud changes] or affect what proportion of emitted LW radiation is allowed to escape to space [eg Water Vapour, cloud changes]. Secondly, how much CO2 [and other GHG] are we going to emit [ie step 0]. You appear to be questioning step 1, which is not in any doubt whatsoever. It is an elementary result that can be reproduced in the lab. Photons of the right wavelength will hit molecules of CO2 and they will be absorbed by them [Quantum Mechanics]. If there is a greater density of CO2 molecules, then the probability of a particular photon, at one of these wavelengths that CO2 absorbs, coming across a CO2 molecule, is clearly increased. As an addendum, the reason that natural variability is often talked about is because the historical observed record is used to test and constrain the models [and the assumptions that they have made about step 0 and step 3], but the natural variability creates a signal to noise problem. If we had many centuries of good-quality observations [ideally over a period when the climate system was in radiative equilibrium…] then it would be much less of an issue. You are mistaken. There are only a finite number of photons of the right wavelengths, and not all of them will hit particular molecules since they are spread out… Thus the ‘ad infinitum’ part of your argument does not apply and there is no problem with CO2 absorbing radiation to take it above the temperature of the atmosphere. That is the whole point. the ambient air. You have probably seen this happen for yourself looking at stack plumes especially on calm days. After the gasses are mixed there is no practical difference between the temperature of the `new’ and `old’ CO2. The only place where different atmospheric gasses can be thought of to possess different temperatures is in the very high atmosphere (edge of space) where densities are so low that collisions between molecules are rare. What the CO2 (both `cold, hot and warm CO2′) and other gasses do is to make the atmosphere more optically thick to thermal IR radiation emitted (mainly) from the Earth’s surface [note2] which has consequences for the equilibrium temperature profile of the atmosphere. To a good approximation, the Earth gets all its energy from the sun in the form of short-wave solar radiation (sun light). Since the atmosphere (barring clouds etc..) is largely transparent to many wavelengths of sun light (if it wasn’t we would have trouble seeing), a good part of this radiation makes it to the surface and is absorbed. That absorbed energy raises the temperature of the surface (you may have noticed how hot some surfaces, like road surfaces, get in direct sun-light). Now, all things emit radiation depending on their temperature [note2], the higher the temperature the more the amount of emitted energy. If there was no atmosphere, the surface of the Earth would heat up until the amount of absorbed sunlight was balanced by the amount of energy lost by radiating thermal IR radiation to space. In this case, the temperature at which this would happen is considerably colder (depending on the fraction of sunlight that is reflected and not absorbed) at about 255K…pretty chilly. We would find also that the temperature difference between being in shadow or in the open would be pretty drastic (take the moon for example). In the presence of an atmosphere (which absorbs/emits in the thermal IR radiation) the picture is different. The energy that is absorbed by the surface can not be radiated directly to space. It is trapped by the atmosphere (which will then raise it’s temperature) [note3]. The degree of trapping depends on how the strength of the gaseous absorption varies with wavelength, which is why different gasses can have vary different impacts on the energy balance which are not directly connected to their relative amounts. The more efficient the trapping of IR radiation in the atmosphere (i.e. the stronger the IR absorption) the more the system (in particular the surface since that is where most of the IR is emitted from) has to warm to bring the amount of IR radiation escaping out to space into balance with the incoming solar radiation absorbed by the Earth. This is why the Top-of-atmosphere (TOA) radiation balance is often discussed. It is a reflection of the fact that, viewed as a whole, to a very very good approximation the Earth can only gain energy from the sun and loss it by radiating it away into space. If you are really interested in this (and not just interested in grasping at straws in a vain hope that adding more GHG’s to the Earth’s atmosphere will have no effect) you should pick up a text book on introductory atmospheric physics or atmospheric radiative transfer. Depending on your background and how deep you want to go, you may also need to enhance your mathematical ability or general physics knowledge. If this is impractical, then you may be able to find some useful articles on the web…but then it can be hard to separate the wheat from the chaff. pressure and dz is the change in height. the link between pressure and temperature within the atmosphere. wavelengths is proportional to T^4 (Stefan-Boltzmann Law). I agree strongly with Joel Shore, and add for John Dobbs, that in situations like this it is often not only what the amature does not know that is a problem, but what he thinks he knows and is wrong. Having studied nuclear engineering is not necessarily helpful, nor are the details of the energy transfer process trivial. Moreover, there are examples in the literature dealing with the questions being asked where people from outside the area of collisional energy transfer have blundered badly, which confuses the situation even more. Finally, let me point out that climate science is using results from chemical physics, but it is unlikely that you will find many climate scientists who really (to use a 60s word) grok the situation. Having set myself up to fail let me point out that as in many of the issues discussed here it is a problem of time scales. Briefly put, the process can be defined as a CO2 molecule absorbing a ~650 cm-1 photon (equivalent to a thermal energy of about 900 K), and losing that energy to the surrounding bath of atmospheric gases. In turn other CO2 molecules can be excited by collisions with atmospheric molecules. Some of them (and a very small percentage of the originally excited CO2 molecules can re-emit). The processes (absorption of light, collisional energy transfer and emission) can be separated because the average time that an isolated CO2 molecule takes before it emits a photon is much longer that the time for collisional de-excitation (~tens of microseconds at atmospheric pressure, less, higher in the atmosphere). Therefore you can model the situation by separating absorption and emission. The absorption rate is readily calculated from Beer’s law I/Io=exp(-N sigma L) (the proportion of light absorbed in a layer of thickness L depends exponentially on the Number density of the absorbers, the absorption cross-section of each molecule and the length of the layer L. Both I and sigma are functions of the light frequency/wavelength). Because collisional energy transfer to and from the excited molecules is rapid, the chunk of energy (650 cm-1) rapidly degrades into the heat bath of the atmosphere. The temperature of the heat bath can be determined from simple thermodynamics by figuring out the rate of heat flow into and out of the system by radiation, convection and conduction. A nuclear engineer should be able to do that part. Thermodynamics assures you that the CO2 is always at the temperature of the heat bath as long as the collisional thermalization step is rapid and it is. To claim that it is at a higher temperature is an amusing form of Zeno’s paradox. It is the same as claiming that if I put hot and cold chunks of metal together the originally hotter one will always be microscopically hotter. At 300K (27 C) ground state CO2 molecules are continually colliding with oxygen, nitrogen and other molecules. The average collision has an energy equivalent to kT where k is Boltzmann’s constant. In units usual to the field this is ~200 cm-1 (multiply by the speed of light in cm/sec and Planck’s constant to get Joules) but some of them have much more energy. A few of the energetic collisions can vibrationally excite the CO2 to the same 650 cm-1 excited vibrational level. Because collisional processes are fast wrt radiation, the number of vibrationally excited CO2 molecules can be characterized by a Boltzman distribution. At 300 K about 6% of the CO2 molecules in the atmosphere are vibrationally excited and can radiate. This, and the radiative emission rate allows you to calculate the radiative heat loss from a packet of atmosphere. It is important to note that the radiative loss from greenhouse gases is ONLY at frequencies that can be absorbed by near-by other near by greenhouse gases* and in all directions. Thus, the process becomes a giant game of pass it on until, by chance the packet of energy reaches the atmospheric door to space. Think of it as a crowded room full of blindfolded people passing packets to each other and a small door through which the packet (eventually) is shoved. *Because of Doppler and pressure broadening the absorption and emission profiles from CO2 are slightly narrower for colder, less dense gases. Thus some of the radiation from a hotter, denser gas lower in the atmosphere, will pass transparently through the colder, diffuser atmosphere higher up. It irks me that people complain about climate models as not being as good as actual data. Well, the reason why we are relying on models (as well as what data we do have) is because we are still in the midst of our little GW experiment on earth. All the data are not in yet, and won’t be for hundreds or thousands of years. Meanwhile models in conjunction with data we do have do a fairly good job in helping us understand what’s going on & what might happen in the future. They may not include all the feedbacks, including all the positive feedbacks – so GW might in reality actually be a more serious problem than the models (coupled with prior/current data) indicate. So, what I suggest is that we stop this diabolical experiment on earth. Reduce our GHGs. Call it quits. And if AGW is halted & we don’t get all our precious data regarding it, welll, too bad for the curious. I am a chemist, not a physicist, but I think I know the answer to your issue in very broad terms. At night the earth re-radiates most of the energy from the sun that builds up during the daytime back into space. I have always heard that the amount of energy that does not get re-radiated back to space is around 1%. This includes the energy trapped by photosynthesis, the majority that is not re-radiated, plus energy that is prevented from re-radiating back by reflecting from cloud cover or aerosols, absorbed by GHGs, and other mechanisms. The energy that is absorbed by GHGs, and this is all of the molecules both young and old, increases their kinetic energy which is quickly shared with nearby molecules. Thus all the molecules of the atmosphere, especially near the surface where they are denser and therefore more numerous due to PV=NRT, are heated to a higher temperature than they otherwise would be. Increasing their concentration in the atmosphere would thus raise the temperature of all the molecules of the atmosphere, especially near the surface due to PV=NRT. There are a huge number of details that climate scientists, physicists and many others have quantified or are in the process of quantifying. Sure, the devil is in the details and the wording of the details which not everyone agrees upon, including you. But the warming effect of increasing the concentration of GHGs seems inevitable to me unless something as yet unknown or something new counteracts it. John Dodds (#22): Others have addressed the technical issue in more detail, so I’ll just comment on two higher-level points. First, re the California state legislature legislating that water vapor is not a greenhouse gas: Well, politicians will be often be silly but in this case I don’t have a big problem with what they did (at least from what you say). Words only have meaning in context and while it may be true that water vapor is a greenhouse gas in the sense that more of it in the atmosphere will absorb more infrared radiation and warm the climate, it is not a greenhouse gas in the sense that it is a gas we need to seriously worry about adding directly to the atmosphere. This is because the time scales for it to “rain out” and the amounts involved are such that humans cannot, at least at this point, put enough of it in the atmosphere directly to significantly alter the global climate (although we may be able to have some local effects). Of course, it does have a significant feedback effect in the sense that our warming of the atmosphere through the release of longer-lived greenhouse gases causes more water to evaporate and thus enhances the warming, but that is a different kettle of fish. So, I think it is perfectly reasonable for politicians, who are worried not about hypertechnical science definitions but rather about policy implications of the science to legislate that (for the purposes of considering emissions and their effect on global climate) they will not consider water vapor to be a greenhouse gas. As for your claim that “the fact that there are a whole lot of people known as skeptics, that says that ‘something’ is just not quite right,” I would have to ask you what you feelings are on evolutionary theory. That is another scientific theory where there are a considerable number of “skeptics”. Unfortunately, skepticism toward scientific theories seems to be more strongly influenced by whether said theories conflict with strongly held religious, political, or philosophical beliefs or powerful economic interests than by whether there is really scientific justification for said skepticism. #29 & #22, I think RealClimate made it clear earlier that water vapor is not a climate FORCING, but is more a response (I forget the word they used) to a warming climate (which draws up more water into the atmosphere – which then contributes briefly to GW, as Joel pointed out). So, one point would be that CO2 & CH4, etc., have climate forcing properties, while H20 does not, and that’s what we need to look at to reduce. Point 2 would be that while nature emits GHGs, we don’t have much control over those, but we do have control over the ones we humans emit, and it is those we should focus on reducing, which I think is what the CA legislature wants to do. What are they going to do, fine the ocean for letting its water evaporate, or caps its emissions??? However, I do have a concern about water vapor. I think once its in the high atmosphere where jets fly, it is harder to precipitate out. And I’ve started imagining a world in which aircraft has converted to hydrogen fuel cells (which I believe is technologically, if not yet economically feasible) & is emitting only water vapor. Would this be a problem, and if so, would it be at least somewhat better than emitting the current aircraft GHGs? A general question about climate models: why are they so complicated? Wouldn’t it be a pretty good first approximation to model a one square meter of earth and the atmosphere above it with average albedo, average solar input, average cloud cover, etc? Then on top of this model you would simply estimate the relevant parameters such as feedbacks, aerosols, etc. I can see why you would want to take into account thermal-induced circulation, but couldn’t this be easily done by modeling a one-meter strip (at the tropics) extending to the poles? It is hard to believe that this wasn’t done very early on … so, what does such a simple model look like? How much different are the results of the more complicated models? Why would water vapor not be a “forcing’? Don’t strong El Ninos lead to increased water vapor which can alter the climate? Doesn’t water vapor spurt out of volcanoes and vent from the Earth? Many factories produce steam as well. Why would this water vapor not be considered alongside CO2 as a “forcing”? Terry: As far as I know you can recreate the IPCC uncertainty range for a response to CO2 doubling by using a simple energy balance model. As gavin points out most of this uncertainty is produced by the cloud feedback. Unfortunately even the complex models that are used aren’t ‘complex’ enough to provide an answer to what sign the cloud feedback is. The current generation of models are a lot better than the previous generation of models though. For a good text book level overview of some `simple’ models see Chapter 8 (esp. Sec 8.4) of “An Introduction to Atmospheric Radiation”, 2nd Ed. by K.N. Liou. #32, re the el nino argument. El ninos in the past were normal events (I believe about every 7 years); however in the present I believe they are increasing in intensity, duration, & frequency. Since what they are is basically a warming of areas in the Pacific, these increases are probably due to GW. A few years back weathermen & others were attributing many GW effects to el ninos, which it seems to me are only intermediatary steps in the complicated GW process. I’d like RealClimate to sometime discuss el ninos & climate change. To me, blaming things on el ninos now in this AGW era (which seem to be ascerbated by GW), is sort of like blaming a gun for killing a person, without looking at the person who pulled the trigger. As far as I’ve heard, El Ninos are entirely natural. Do you have any links that support your statement? … which is a warming process, right? Isn’t relative humidity dependent on temperature? Am I missing something? El-Nino’s are natural, but given the huge perturbation to the climate system by globabl warming, natural oscillations of the climate system such as ENSO [El-Nino Southern Oscillation] are bound to be affected. What kind of science is this? Do you have any audited or peer-reviewed studies that you can link to that relate El Ninos to anything other that entirely natural phenomena? How do you know that it is not the El Ninos causing the warming instead of the other way around? El Nino is a cyclical phenomenon with the length of these cycles being less than a decade (i.e. it takes c. 7 years to go from an El Nino to La Nina and back again to an El Nino). The current warming the Earth has experienced cannot be called cyclical, since the climate increasing its temperature at an exponential rate with no signs of cooling on the horizon (unless the unlikely event of the shutdown of the North Atlantic conveyor system occurs). This began roughly 150 years ago and, with the exception of a few short intervals of steady (or even very slight decreases in) temperatures, the planet continues to warm at an even more rapid rate. Since this is the case, that the ENSO cycle is so much shorter, there is no relation between the two phenomena (ENSO and GW), with the exception that GW may trigger a change in the nature of ENSO, increasing its frequency (i.e. reducing the time it takes to complete a cycle) and/or increasing its intensity (putting people in affected areas at risk of experiencing worse famine-causing droughts, flooding, and storms).